Already in the thick of planning your wedding? Getting everything together—picking out colors, seeking confirmation from guests, ordering the reception area décor, organizing the bridal shower and rehearsal dinner, etc.? One more thing. And please don’t panic. 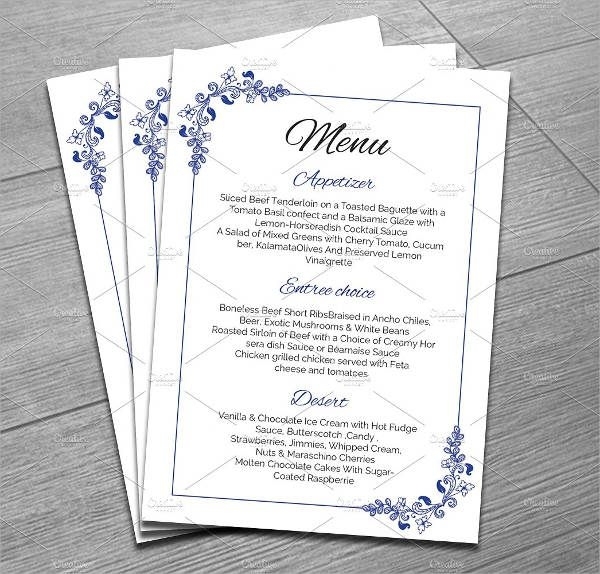 Have you thought about your menu and how it should look? Well, you don’t have to worry your pretty little head anymore. You don’t want wrinkles on your wedding day, do you? 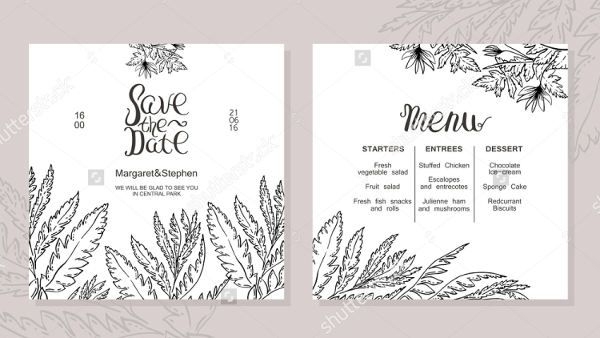 The wedding planning gods have smiled down upon you and have given you these wedding Menu Designs. They come in a variety of designs and formats such as, JPG, PSD, and AI Illustrator, for ease of download and customization! 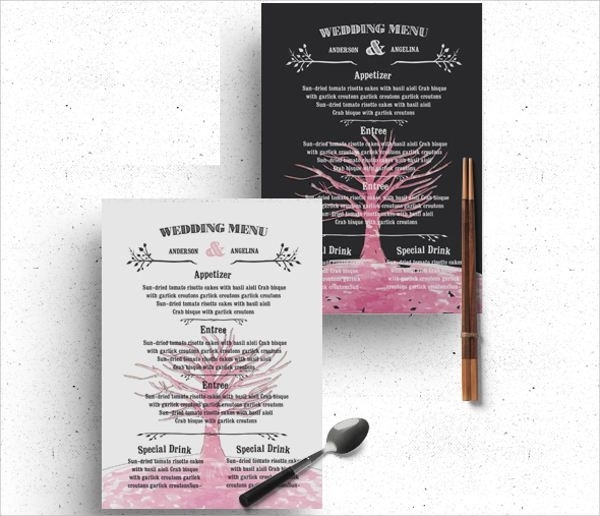 Poring over thousands of Wedding Sample Designs does have a certain magic to it, and it’s especially true as you do so with this collection of wedding menu designs. 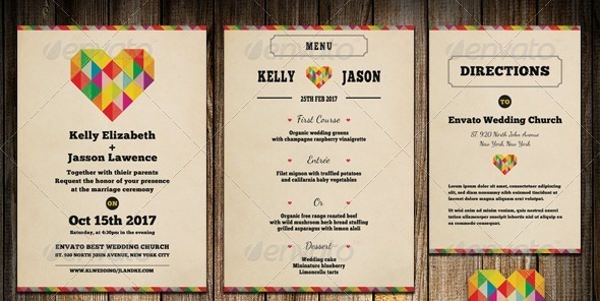 Here it is evident how you can go about your wedding menus in a number of different styles. 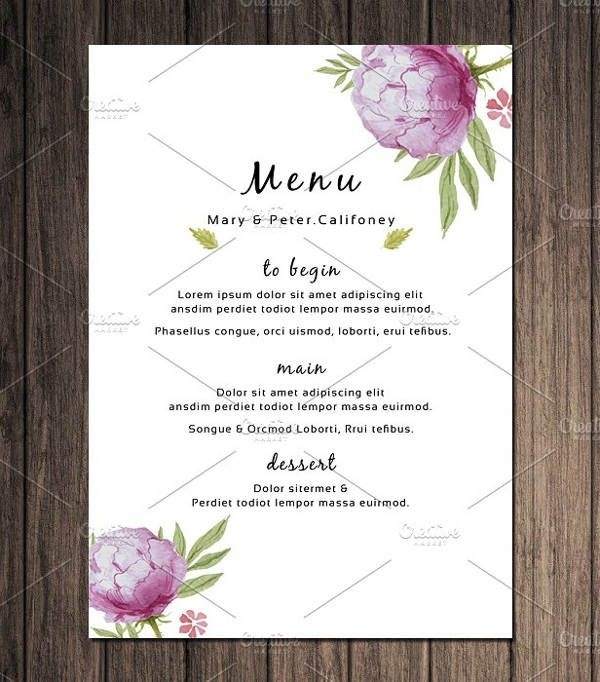 You can opt for a single flower gracing just two corners of the card like in “Wedding Reception Menu” or a corsage-like design at the top, front and center like in “Floral Printable Wedding Menu.” You can also go for something a bit more elaborate as in “Sample Wedding Menu,” but you gotta be careful with the color scheme since the design is already very intricate (you don’t want the writing on the card to be “overpowered” by the adornments). 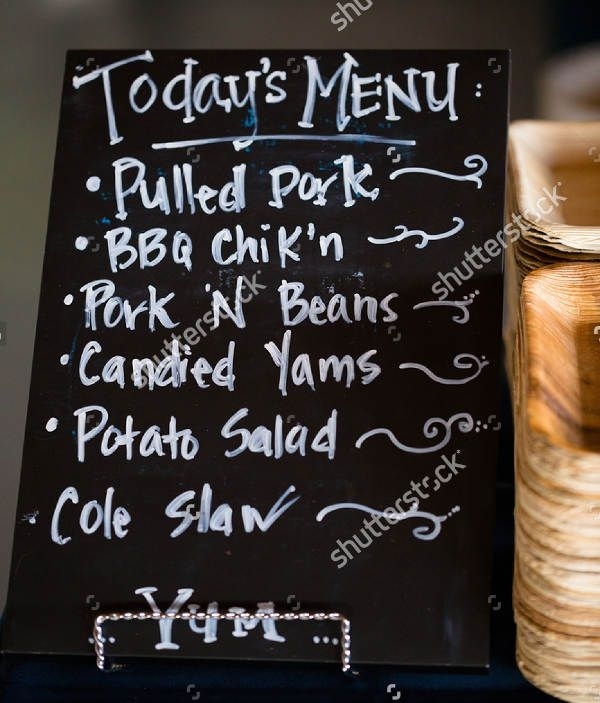 If your reception is more on the laid-back, warm, cozy end of the spectrum, the chalkboard menu designs “BBQ Wedding Menu” and “Chalkboard Wedding Menu” are going to do the job. This is perfect for those opting for a rustic theme. 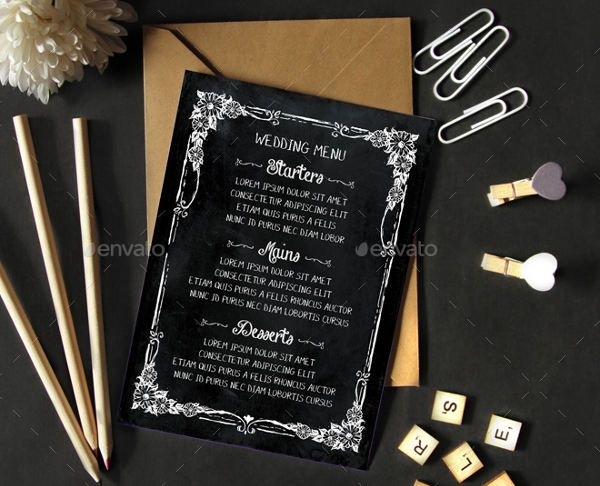 For those with more eclectic tastes, check out “Wedding Menu Card” with its clever inverted color version. 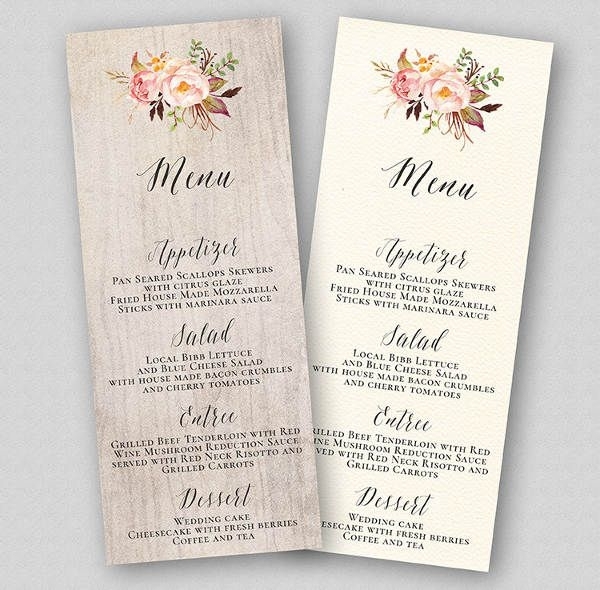 The “DIY Wedding Menu” is also very much worth noting as it has a more dreamy and whimsical feel. Well, of course. But let’s not stick to weddings. There are other events wherein these designs would work perfectly. For the wedding-related ones, you have the bridal shower and the rehearsal dinner. For others, you have dating mixers maybe, couple’s cooking class, birthday parties even, and plenty more. Sometimes when we’re so used to our job, it becomes mundane, and we end up going through each day and each task mechanically. A way to remedy this would be to look at other people’s works and glean some inspiration from them. Maybe even incorporate a thing or two into your own to switch things up a little. All you have to do is remove all the text in the template, and voila! Insta-stationery! It’s good to have those saved up for when you have to write someone back a thank-you note or when your teacher asks you to bring some artsy supplies for a class project. Now that you have your options and some suggestions on how to treat them, what are you dawdling around for? Click on download now!